Camping is a favorite past-time activities for our families. All the kids are out of school during the summer time to enjoy the fresh outdoors. Gathering around the campfire on a cold night in the mountains telling stories. Labor day is one of the last opportunities for the season to camp and the temperatures are dropping. 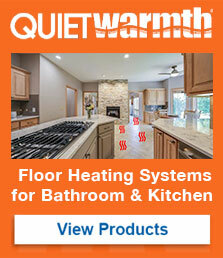 One of the main concerns is the space under the flooring for radiant heating. Hydronic Systems is completely out of the question as this will take up way too much space. You would have to consider the electric heating film for ease of installation. The pro’s of electric heating film is the thinness of the mats. No more than the height of a credit card, you won’t lose space in an already limited quarters. With the mats running either 120V or 240V, this allows no bulky equipment to be installed in the RV/camper. QuietWarmth although not tested for RV/motorhome applications, countless successful stories of users installing the systems in their campers. QuietWarmth radiant heat films are a little wider in size compare to some competitors, allowing to reduce the amount of mats needed to be connected. Family members will be warm during cold nights to help the family get the sleep they deserve for tomorrow’s activities. When you wake up on a frosty morning, wouldn’t it be great if the RV floor was nice and toasty, making it easier to get out of the bunk and start the day? The development of low-voltage electric radiant floor heating means that travel trailers, RVs and tiny houses can have the comfort and efficiency of radiant floor heating in small spaces.